Some of my favourite recipes tend to be the simplest ones. And when it comes to simple recipes, few can compete with the man from down-under Bill Granger. I’m a big big Bill Granger fan. The guy just looks so relaxed and at ease when he’s cooking it’s impossible not to be infected by that same, happy-go-lucky feeling just watching him on the tele. Here’s a little something I adapted from a pasta I watched him rustle up on Bill’s Holiday where he used chunks of prime Bluefin tuna steak from a real beauty caught fresh out of the waters off South Australia. Unfortunately, fresh Bluefin Tuna isn’t exactly something you can find in your everyday London supermarket. So, to the trusty store cupboard it was. Behold, the good ‘ol John West canned variety (probably the furthest thing from fresh Bluefin!). What really makes the dish however is the depth of flavour you get from the anchovy fillets when they are melted into the sauce. Together with the sweetness from the vine-ripened tomatoes, kick of juicy savouriness from the black olives and the fragrant burst of the basil leaves, even John West Tuna can get the makeover of all makeovers into one ridiculously delicious dish. Give it a go! Cook the pasta in a pan of salted boiling water according to the packet instructions, draining a minute or 2 before the full cooking time to keep it al dente. In a large pan, heat up a couple tablespoons of olive oil to a medium-to-high heat, then sautee the chopped onion, garlic & chillies for 1-2 minutes. Add in the sliced tomatoes and anchovy fillets, and cook for 3-4 minutes until the tomato juices and anchovies start to melt together to form a light sauce. Drain any excess oil from the canned Tuna, then add it into the pan along with the Olives. Cook for a further 2-3 minutes until the tuna chunks have mixed well with the anchovy and tomato juices. Deglaze the pan with a small glass of white wine, making sure to boil off the alcohol. Add the cooked pasta and toss around the sauce for 1-2 minutes. Add the torn Basil leaves and turn off the heat. Season with salt and freshly ground black pepper to taste and serve up immediately (go easy on the salt, the anchovies are pretty tasty in their own right already). Canned Tuna never tasted better. Seriously. p.s. if using fresh tuna chunks instead of canned, I’d suggest following Bill’s recipe which you can find here and searing the tuna first before cooking the rest of the ingredients. 2 minutes on each side on a high heat should suffice as you want to keep the centre of the tuna nice and rare. 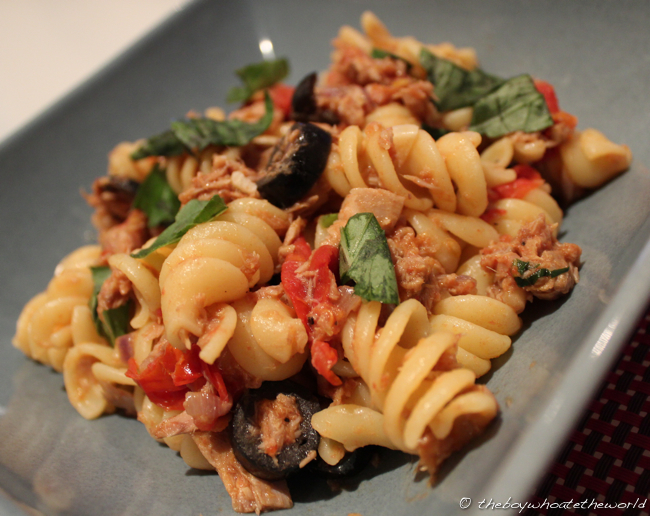 The male essential food – tuna pasta! hehe. Will try this recipe out! 🙂 Always good for a quick dinner. Sounds like C has fed you many a time with the Tuna Pasta eh! The Anchovies and Basil are what makes the whole world of difference here! !